Should we preserve the eggs of endangered species? A recent paper by Caterina Wiedemann describing her success in freezing and thawing the egg cells of several different cat species is raising an interesting question about our efforts to preserve endangered animals. We've got a doomsday seed vault in the Arctic, so why not create egg vaults, too? To be more specific about Wiedemann's achievement, she managed to both freeze and thaw feline oocytes (immature ovums, or egg cells) still packed in the ovary cortex. These cells were exposed to minus 196 degrees Celsius in vats of liquid nitrogen. It's basically cryopreservation. The ovarian cortex is the reservoir of these reproductive cells, and it contains thousands of oocytes. Storing the entire cortex, therefore, would help to ensure genetic diversity when kickstarting an endangered (or even extinct) species. Wiedemann used a freezing procedure that's used in human medicine. Women who are suffering from cancer often have their ovarian tissue removed to avoid damage from chemotherapy or radiotherapy. 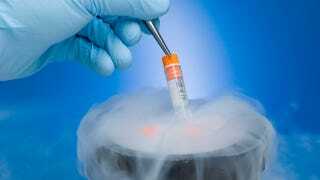 "This is the first report of preserving a huge amount of follicles within ovarian tissue by slow freezing performed in several wild feline species," she noted in the study. Wiedemann looked at felid species specifically because all wild cats are currently listed on the Red List for endangered species of the International Union for Conservation of Nature (IUCN). Interestingly, the Leibniz Institute for Zoo and Wildlife Research in Berlin, where the study took place, has its own genome resource bank which it calls "Arche." In addition to these oocytes, it also contains a variety of sperm samples taken from various wildlife species. Seeing as we're having great success freezing and thawing the oocytes of humans and cats, it's not a stretch to suggest that we can do the same for other mammals as well. Perhaps its time to start thinking seriously about an egg vault. Check out Wideman's study here (pdf). Top image: isisrfc, inset image: Pyshnyy Maxim Vjacheslavovich/shutterstock.